Now that the corset is done, it's time to make the armor. I did a quick sketch of my armor to get an idea of how I wanted everything to look. 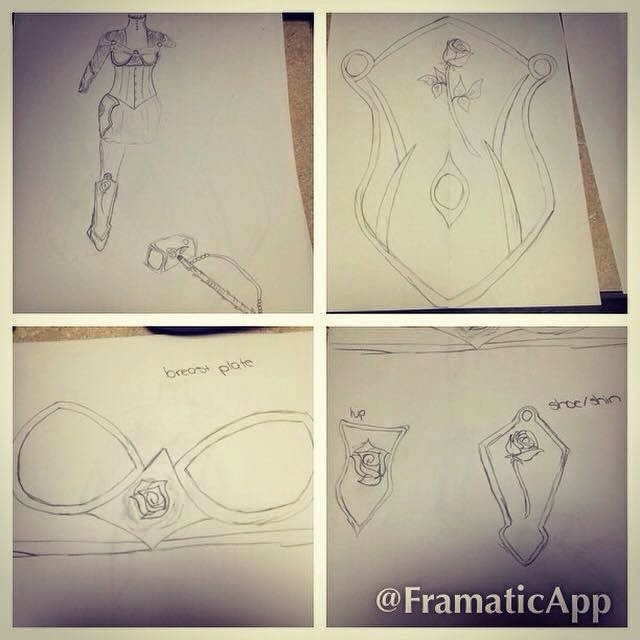 I also decided to make bracers, breast plate, hip armor, and shin armor. Once you have the basic idea, you'll need to make your patterns. Basically, I took a few measurements (wrist to elbow, wrist circumference, elbow circumference, etc) and marked those on paper. 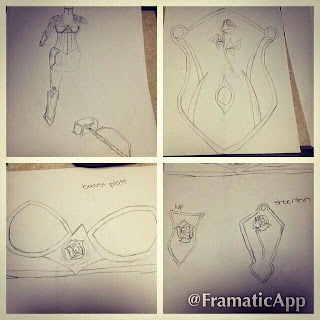 Then, I traced out my design for half the armor piece. Then, fold in half and cut out. Repeat this process for all of your armor pieces. Test fit and make sure nothing needs to be trimmed up, or expanded. Next, use your pattern to cut your pieces out of craft foam. Remember to cut two of each (except for breast plate). Test fit again and make sure everything fits how you want it to. Now, it's time to cut out the worbla. I decided to try the sandwich method for this project. Basically, you cut out two pieces of worbla per armor piece and sandwich the foam between the worbla. On hindsight, I think you could save yourself some worbla by simply folding over the sides, instead of sandwiching. I used nearly an entire extra large roll of worbla for my armor. If you decide to do the sandwich method, here are my step by step instructions. If you'd like to do the fold over method, I recommend going to worbla.com and reading about the process to do so. When working with worbla, you want the shiny sides to go together. First, heat the shiny side of one of your pieces until it turns a caramel color. Note: During this process, I figured out a slightly easier way (for me) to do the curved pieces. Once the worbla was heated, I'd apply the foam, then bend it into shape. Once semi cool, I'd then heat the second piece, and carefully bend it to fit inside onto the foam. That's not how I did most of mine, but I did discover it after making most of my pieces. Place foam on top of heated worbla and press down. Heat second piece and place on top of craft foam. Press down seams, reheating as needed. Bend into curve, heating as needed. Heat seam and trim with scissors while hot. If any of the seams open up, reheat and press closed. Repeat process with all of your armor pieces (minus breast plate). Now for details! I decided to try using worbla for detailing, instead of creating my details out of foam and gluing onto the foam, then covering with worbla. I'm not sure I'm sold on this method. To do a border, I used a straight edge of scrap worbla and measured 1/4" and drew a line. Then, I cut it out. Heat this strip then place along edge of armor. Repeat for all armor. On my bracers, I decided to add more than just a border and the rose piece I will show you how to make later. I sketched this out onto the armor, then used some newspaper to trace over the sketch, and cut the pieces from worbla. Heat and apply. Now, sand everything. I would recommend using a dremel and make sure you have lots of bits because worbla tends to gum up the sand paper. That's it for part one. In part two I will link you to the video tutorial for my instamorph roses. Then, the tutorial will finish your armor.